"I am glad that I discovered your system...I'm already up 2.1%...this will be my new income stream" - Mark S.
Thanks to Mark S. for sharing his recent experience with the CDx3 Income Engine and welcome to all of the new CDx3 Newsletter subscribers who signed up during July. This is your first issue of the CDx3 Newsletter, a free monthly newsletter devoted to the interests of CDx3 Preferred Stock investors. The ten CDx3 Selection Criteria from Chapter 1 of Preferred Stock Investing eliminate about 90% of the regular preferred stocks and select out just the highest quality issues - CDx3 Preferred Stocks. To reduce risk even further, CDx3 Investors can choose from CDx3 Preferred Stocks from a variety of business segments. The Last Month's CDx3 Investor Results article below identifies the yields being paid by CDx3 Preferred Stocks from eight segments over the last two months, including the red hot apartment community segment where occupancy rates are booming. Preferred Stock Investing goes to college! While not a textbook, Preferred Stock Investing is read at many universities and colleges to show students how the market price of preferred stocks behaves during different economic conditions and the reasons why. The Special Announcement article provides a link to a new back-to-school promotion for Preferred Stock Investing that is currently being run by Amazon.com. The CDx3 Company Spotlight this month shines on Hawaiian Electric Industries, issuer of CDx3 Preferred Stock. This utility faces a very unique set of challenges in providing electricity to 95% of the island state's population and has been paying dividends every quarter to its shareholders since 1901. There has never been a case where a company that issues CDx3 Preferred Stock has suspended dividend payments to those who own shares - not one, ever. But that doesn't mean that it cannot or never will happen so, not being clairvoyant, investors often wonder if there is a way to tell - in advance - if a company might stop paying the dividends on their preferred stocks. This month's CDx3 Question Of The Month article describes an early warning system for CDx3 Investors. Has "The Market" overreacted to the current credit crisis by pulling out of bank stocks more than the actual risk justifies? If so, the run-for-your-life attitude of some investors may create the opportunity-of-a-lifetime for others. And, as it turns out, there is a way to tell which is which and I will present it to you in next month's issue of the CDx3 Newsletter. CDx3 Preferred Stocks* provide an excellent opportunity to not only earn great dividend and capital gain income, but also diversity your portfolio at the same time. The current average annual dividend rate being paid by CDx3 Preferred Stocks is 8.875% with yields running even higher. Decades ago preferred stocks were only issued by utilities (such as Hawaiian Electric), but now many types of businesses offer them allowing you to salt your portfolio with holdings from different segments of our economy. This type of investment diversification allows you to take advantage of boom times and spread your risk during periods when the economy slows down. 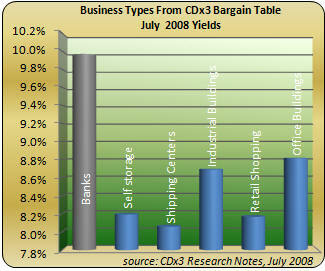 Subscribers to the CDx3 Notification Service receive a list each month, called the CDx3 Bargain Table (what's this? ), that identifies the highest quality preferred stocks - CDx3 Preferred Stocks - that are ripe for purchasing. Last month, the CDx3 Bargain Table identified CDx3 Preferred Stocks from six business types producing an average annual yield of 8.6%. Throughout July, CDx3 Investors considered adding CDx3 Preferred Stocks from these segments of our economy to their CDx3 Portfolios. 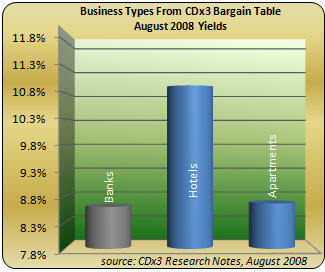 On July 31, 2008, subscribers to the CDx3 Notification Service received the CDx3 Bargain Table for August that identified CDx3 Preferred Stocks from two more business segments - hotels and apartments. The CDx3 Preferred Stocks from hotel and apartment companies identified for August are offering CDx3 Investors an average annual yield of 10.9% and 8.7%, respectively. The credit crisis and weak home market have fired up the demand for apartments, with occupancy rates surging. The U.S. Census Bureau reports that about 3% of homes in the U.S. are currently vacant - the highest home vacancy rate in 20 years. The June 2008 issue of the CDx3 Newsletter introduced you to BRE Properties, a $2.5 billion issuer of CDx3 Preferred Stock enjoying huge demand for their apartment communities. In addition to knowing how to screen, buy and sell the highest quality preferred stocks, CDx3 Investors are able to diversity their CDx3 Portfolios by using the CDx3 Bargain Table each month; that is, invest in a number of different CDx3 Preferred Stocks, issued by a number of different companies that are in a number of different businesses. The CDx3 Bargain Table that many buyers of CDx3 Preferred Stock use each month to identify purchase candidates allows subscribers to the CDx3 Notification Service to diversity their CDx3 Portfolios, spreading investment risk while earning way above average fixed-dividend income. * CDx3 Preferred Stock: CDx3 Investors are only interested in the highest quality preferred stocks and there are lots of pretenders to weed out. Applying the CDx3 Selection Criteria (Preferred Stock Investing, Chapter 1) will eliminate about 90% of the regular preferred stocks trading on today's stock market. Amazon has apparently noticed that Preferred Stock Investing gets a lot of interest from colleges and universities. As we ramp up to another school year, Amazon has included Preferred Stock Investing in their special text book program (note the "Special Offers Available" link at Amazon.com). Even though Preferred Stock Investing is not a text book, many institutions of higher learning use the book to teach students how the market price of certain preferred stocks behaves and the reasons why. To learn about Amazon's fall textbook promotion for Preferred Stock Investing, click here. And more good news from Amazon - they have continued the special book pricing of $17.96 that they started in June. Amazon can end this special promotion at any time, so if you've been thinking about picking up a copy of Preferred Stock Investing at a great price, for yourself or for a student, now is the time. CDx3 Preferred Stocks offer investors an opportunity to substantially diversify their portfolios since CDx3 Preferred Stocks are issued by companies in a variety of businesses. Hawaii's electric company faces some unique challenges while providing electricity to 95% of the population. On the mainland, utilities can obtain power from each other to meet varying demand. But on the Hawaiian islands, the fact that each county is surrounded by water prevents such long distance sharing. Each island must be able to independently generate enough electricity to meet its own demand and has to be entirely self-reliant. So each island system is sized to handle its peak load demand, but what happens when a plant needs to go offline for regular or unplanned maintenance? While HEI's electricity generation is primarily oil- based, which all has to be imported either in crude or refined form, HEI's power plants are not the primary user of imported oil in the islands. Somewhat uniquely, the largest single use of the oil that is imported to the Hawaiian islands is for air transportation (jet fuel) at 37%. Electricity production accounts for 30%. Hawaiian Electric has paid a quarterly dividend on its common stock every quarter consistently since 1901. Since preferred stock dividends always get paid before common stock dividends, you can see why HEI's CDx3 Preferred Stock is popular with subscribers to the CDx3 Notification Service. Is there a way to tell if a company might stop paying dividends? - Rita T.
The more I research CDx3 Preferred Stocks the more I find aspects of them that are pretty easy to warm up to. And I’m not talking about the obvious things like above-average dividend income, monthly income generation, a spotless dividend track record or the high degree of market price predictability. You get all of those characteristics with CDx3 Preferred Stocks automatically. I’m talking about other details and mechanics that make CDx3 Preferred Stocks very easy to like. For example, CDx3 Preferred Stocks have a built-in “early warning system” that lets you know in advance if your risk-o-meter should be flashing. Now remember, there has never been a case where the issuing company of a CDx3 Preferred Stock has (a) been downgraded below ‘investment grade’ or (b) suspended a preferred stock dividend, much less (c) gone bankrupt. That doesn’t mean that these maladies cannot happen or that they never will happen; but historically they never have. Got Cash? : Companies have a wide variety of mechanisms that they can use in order to raise money. For example, they can issue bonds (IOUs), preferred stock or common stock. Don’t get bogged down in the terminology; this is really simple. When a company issues a bond, they are saying they want you to loan them your cash. A bond is a piece of paper that functions as an IOU or a receipt that you receive from the issuing company promising to pay you back, with interest, at a certain rate and on a certain schedule. That’s a bond. The issuing company is now in debt to you (rather than the other way around for a change), so on the company’s books they show their obligation to you under the heading “debt” – this is money they have borrowed from you and others. Equity: Another way a company can raise money is to issue preferred stock. When you give a company your cash in exchange for a share of preferred stock you are buying a piece of the company (you own a piece of the rock). The company therefore records your holdings of their preferred stock under the heading “equity” on their books. Like a bond, the preferred stock comes with an agreement (the prospectus) that says that the company will pay you interest (or dividends, but don’t worry about the distinction now) at a certain rate and on a certain schedule. But if the company runs short of cash, bond holders are paid before preferred stock holders, so there is a certain amount of risk involved, but preferred stock dividends are considerably higher than bonds. That brings us to common stock. Like preferred stock, when a company sells their dividend-paying common stock to you, your holdings are recorded as equity on the company’s books (you own a piece of the company), but there is no assurance provided by the company that you will ever receive any dividend payments. That is, with common stock the dividends can be suspended at any time without penalty to the issuing company (i.e. common stock dividends are at risk at all times). 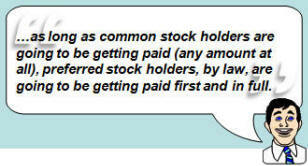 Plus, holders of common stock get paid after preferred stock holders (hence the name “preferred”). Early Warning System: Here’s the cool early warning system for CDx3 Preferred Stocks- every quarter, companies that issue CDx3 Preferred Stocks have to announce whether or not they have enough cash to pay the upcoming dividends to holders of their common stock. When doing so, the company may increase their common stock dividend, decrease it, eliminate it entirely or leave it the same. As long as the issuing company pays a common stock dividend, even it is $0.0000001 per share, you, as a preferred stock holder, know that you are going be getting paid your full dividend amount. In other words, as long as common stock holders are going to be getting paid (any amount at all), preferred stock holders, by law, are going to be getting paid first and in full. So the common stock dividend announcements that company’s make act as an early warning system for preferred stock share holders. Companies make these announcements every quarter a few weeks before the dividends actually get paid. So, if you find yourself concerned about your next preferred stock dividend payment, just keep an eye on the company’s common stock dividend announcements. These announcements are made with the quarterly financial results that are filed with the Securities and Exchange Commission (SEC) and the schedule for upcoming announcements is generally posted on the company’s web site under Investor Relations. Thanks to Rita for the great question. 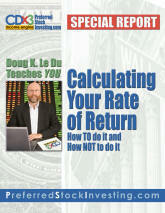 You will receive a free copy of the CDx3 Special Report "Dividend Accounting." Click to submit your question. The economic turmoil that has resulted from the current credit crisis has made many individual investors very wary of investing in the country's banks. As The Market (you and me) has shied away, the market price of many preferred stocks issued by banks has dropped accordingly. Every quarter, publicly traded companies are required to declare how they are doing, financially speaking. The Market reacts to these declarations by buying or selling the stocks, both common and preferred, issued by these companies. By watching the market price movement of CDx3 Preferred Stocks, one can get an idea of how The Market views the investment risk associated with a particular company's preferred stock issues. Similarly, the rating agencies (Moody's, Standard & Poor's, Fitch) comb through the details of these filings and update, or not, their creditworthiness ratings of these companies and their CDx3 Preferred Stocks. The resulting ratings are intended to quantify the investment risk of the company's common and preferred stock issues. In next month's CDx3 Newsletter I will show you how to answer the question "has The Market overreacted?" and pushed market prices down farther than the risk really justifies. Where that is the case, there could be once-in-a-lifetime investment opportunities available since many CDx3 Preferred Stocks issued by banks are now paying yields over 10%. Opportunity of a lifetime or too good to be true - I'll report back to you in next month's CDx3 Newsletter.